Are explainer videos the right marketing tool for all industries? There is no right or wrong answer here, but as one of Arizona’s top production companies, we’ve seen huge success with the explainer video projects we’ve worked on. It’s one thing to use animated explainer videos but another to place them on your website and other marketing outlets. Industries and companies that are taking advantage of the many benefits videos offer are already a step ahead of the game. Videos are your secret weapon for SEO (search engine optimization). Google searches for the most useful content on the web to cater to specific ‘web surfers’. A not so surprising fact, but Google has found that searchers love video content that can entertain and educate. In addition, the search engine thrives on video content and sees a video as the most interesting content on the web. Did you know that websites with video content rank higher on Google? Better yet, 52% of marketers say that online video content has the best ROI (return on investment). Animated explainer videos not only provide that beloved video content but improve view rates by keeping viewers engaged. Here at Epic, we are professional animation creators. We can not only produce your video in-house but also place it digitally. 52% of marketers say that online video content has the best ROI. The finance industry requires a well thought-out marketing strategy in order to attract the right audience. This video we produced for Pima Federal Credit Union strives to build a connection with the viewer. It gives them a chance to create a bond with the brand through visual storytelling. This animated explainer video showcases how their services can play a role in their consumer’s lives. Animated videos explain a product or service in a storytelling format that keeps viewers locked in on the content. Whether you need to tell your company’s story or promote a new or existing service, an animated explainer video can cover all bases, especially in the financial industry. The medical and healthcare industry can sometimes be tough to explain and challenging for patients to comprehend because of its complexity. Through animated explainer videos, your topic can be described in an easy to digest format. This animated video we produced for GSRx explained their company story and the many services they offer; all while building a solid foundation of trust. Animated videos are a great resource for medical organizations to educate employees on new practices, show consumers changes in the company, or explain new products. When healthcare companies put videos online, they make it easier for customers to obtain information when they need it, on an easy to access platform. The ever-changing technology industry can be complicated to explain to consumers. Animated explainer videos allow for these complex and dynamic ideas to be easily understood. Take a look at this software demo video we produced for IRIS. By using animation, we are able to dilute a hard to understand concept and help viewers wrap their head around the service. Animated videos also help show the need for an item in a memorable format. Whether it’s a new software, an app, or other tech related products; animated explainer videos are essential in the tech world. 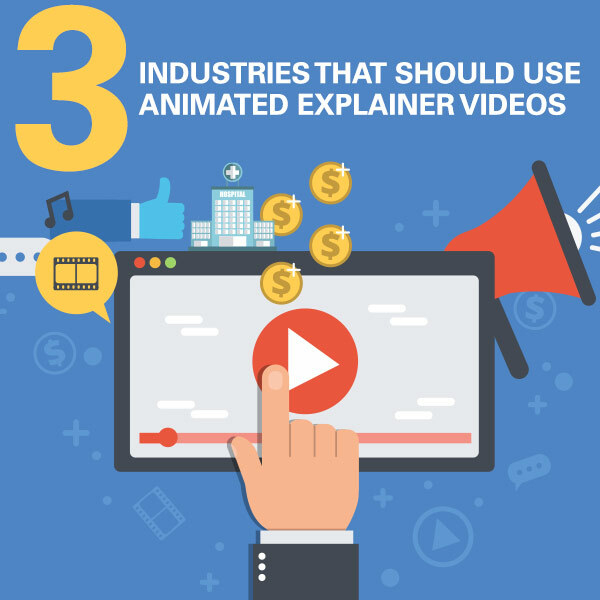 In conclusion, all industries are able to use animated explainer videos as this unique type of online animation storytelling is customer-centric. What we mean by ‘customer-centric’ is that you are putting your customers first. As a result, you’re quickly providing them the information that they are looking for and explaining their need for your product. Using video to build that connection is the first step. From there, putting it on your site will keep them intrigued longer. Did you know that 45% of businesses who use video say they have an explainer video on their home page? Law enforcement, medical, automotive, technology, non-profits, real estate, and financial industries are all hopping on board as these videos market themselves. Some industries are even using these videos for social media content. Animated explainer videos are the perfect content for social sharing due to the fact that they are shared 12x more than links and text combined. Now it’s your turn. Reach out to us and see what we can do for you! As one of Arizona’s top production companies, we can help you create the perfect animated video for your industry.